Apple Jelly Pare as many apples as you think will fill your mould, when they are stew'd add better than half a pound of lump sugar, a little water and a few cloves cover them close down in the pan, they must stew till they are red and stiff like a preserve - put it into any shaped mould you like. Seed Cake Mrs Clerveaux [Chaqter?] 24 ounces of butter 24 ounces of flower, 24 ounces of sifted lump sugar twelve eggs leaving out the whites of 3 or 4 Bake it 2 hours. Carraway Seeds to your taste. 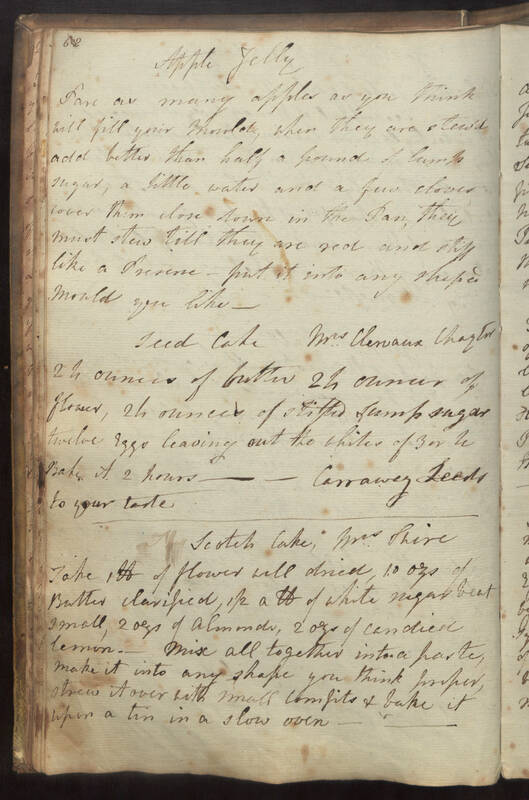 Scotch Cake Mrs Shire Take 1 lb of flower well dried, 1.0 ozs of Butter clarified, 1/2 a lb of white sugar beat small, 2 ozs of almonds, 2 ozs of candied lemon. Mix all together into a paste, make it into any shape you think proper, strew it over with small comfits & bake it upon a tin in a slow oven.